President Trump on Friday again claimed that human traffickers taped women’s mouths at the border. This was Trump’s cynical ploy to get his wall. Meanwhile, here are stories that belie his concern for trafficked women. 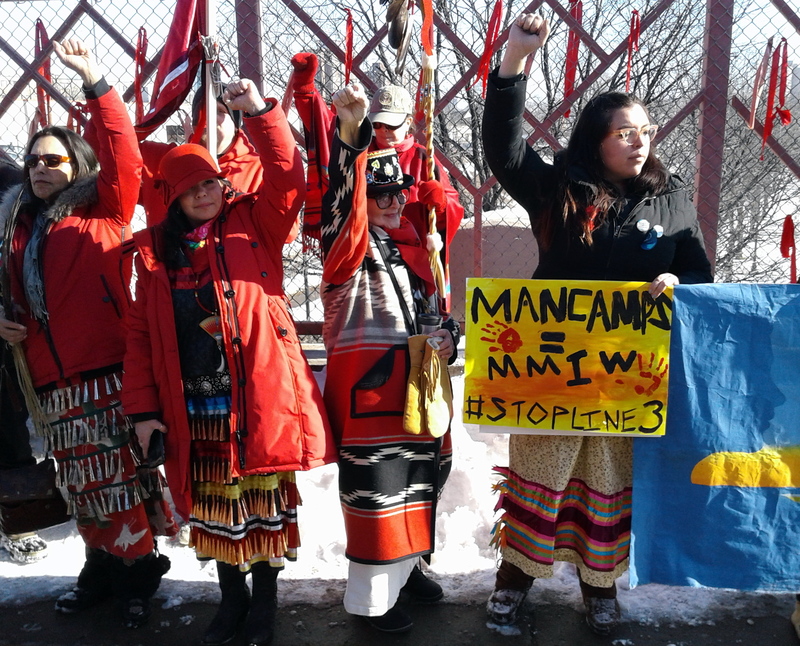 File: Missing and Murdered Indigenous Women’s March in Minneapolis (2018). In his first week in office, Trump revived the Dakota Access Pipeline and the Keystone XL Pipeline, actively supporting oil extraction and related projects known to increase violence against women. The arrival of highly paid oil workers living in sprawling “man camps” with limited spending opportunities has led to a crime wave — including murders, aggravated assaults, rapes, human trafficking and robberies — fueled by a huge market for illegal drugs, primarily heroin and methamphetamine. According to lead researchers, the National Institute of Justice cited “administration issues” for the scuttling of the report. Upon requests for more information, the NIJ did not elaborate further. The bill to better coordinate information passed the U.S. Senate but was held up by one member of the U.S. House of Representatives — then Judiciary Committee Chair Rep. Bob Goodlatte of Virginia. The bill died this past Dec. 21 when the House adjourned. If the human trafficking were a Trump priority, surely he could have convinced Goodlatte to move the legislation. Now the bill has to start over in the new Congressional session. This is a march for Missing and Murdered Indigenous Women, Girls, Boys, Two Spirit and Transgender Relatives. WEAR RED! Bring Banners, Posters, Staffs, Drums, Rattles. Meet at the Minneapolis American Indian Center at 1530 E. Franklin Ave. in Minneapolis. Here is the Facebook Page. 11-11:30 a.m.: Sign In, Make Posters, Visit Information Tables, Visit Each Other! 11:30 a.m. – Noon: Opening prayer, welcome song, and guest speakers. Prepare to depart on the walk. 1-2 p.m.: Honor Song for those who have lost loved ones. Open microphone to share . Coffee and snacks provided by Gatherings Cafe. Closing remarks.